After 15 years with IBM, Dana retired in May of 2012. Wanting to stay active and having heard Pastor Paul Turner mention the need for an office manager during services at The Church Without Walls, in June she volunteered, and has been the Pastor’s Personal Assistant ever since (Either crazy or a glutton for punishment). Actually she enjoys the variety of work and people, and it goes along with her years of public service. A DuPont brat from Delaware, getting here has been an interesting journey! After High School, Dana went to Kemper Military School and College in Missouri, becoming the photographer and editor for the school newspaper, alumni news, and yearbook. With an AA Degree in hand, she transferred to GA Tech. This being Vietnam War era, 2 years later her studies were interrupted by the Uncle Sam with a “request” she present herself for military service. Due to the draft having an attendant risk of serious bodily harm, and learning she could pick her specialty, she enlisted in the US Army Signal Corps, choosing Cryptographic System Repair, the 2nd longest school the Army offered. After Army Basic Training she married Carolyn, and upon graduation from Advanced School was assigned to Germany. They enjoyed a 14 month tour, traveling when possible. A visit to the concentration camp at Dachau left indelible memories that were a serious driving force in her later activism. Returning to GA Tech, and ultimately finding she was more hands on, she transferred to Southern Technical Institute. During her last years of college, she went to school by day, and worked full time night shift as an engineering lab technician at Scientific Atlanta, helping to develop their MARISAT (Marine Satellite) ground station equipment. In 1976 she graduated with a BS in Electrical Engineering Technology. During her career, Dana refused to specialize, preferring to see the wider view, and keep her options open. After college Dana was a Field Engineer for SRL Medical installing, training and repairing computerized lung testing machines all over the country. After 2 years, tiring of 7 day a week travel, she resigned. Without a job, Dana took temp assignments, mostly with Wink-O-Matic Signal, assisting in the design of, and manufacturing planning for, traffic signals and trailer mounted message signs. A friend steered her to a permanent position of Quality Assurance Inspector with Scientific Atlanta. This developed into QA Engineering, then Components Engineer, Manufacturing Engineer, and a second hat as Safety Coordinator. In her spare time(? ), she was part of a local computer users group that designed and built the first internal computer telephone data modem. In the 1990s, electronic manufacturing moved off shore. Forced out, she joined GE Computer service as a QA, and later repair, technician. The division was acquired by IBM five years later, and she moved to Service Planning. Her last 14 years were spent as a Customer Service Representative providing telephone technical support to field technicians. Despite being a high stress position, she enjoyed the variety of work and people. She also dabbled in computer programming numerous times along the way. Aside from her regular duties, and what has helped her at Gentle Spirit, is that she was a founding member, and first Secretary, for the IBM Atlanta Women’s Networking Group, holding the position continuously until retirement 10 years later. After a lifetime of internal conflict, Dana transitioned from male to female in June of 2000, on the job and in place (unusual to stay in place up to that time) at IBM. (female pronouns used in this bio for convenience). “It is the most difficult path I have walked, but also the most educational experience I have ever had, and I am far better for it! BUT, I wouldn’t wish it on anyone!” She first met Pastor Paul after becoming involved as a GLBT activist. Elected as representative for IBM’s Atlanta GLBT Diversity Group, and as the first fully ”out” ‘T’ at IBM, she became a global company resource. Her “open and out” activist efforts in industry helped change the HR policies, to support Transgender in at least five Fortune 500, and several other large companies. She was invited by 3 local GLBT organizations to be on their Board of Directors (Secretary of one), and served as Secretary, Operations, and Vice President for the Atlanta transgender activist group Trans=Action. She co-organized, and for two years co-chaired, the first HRC Diversity Committee. 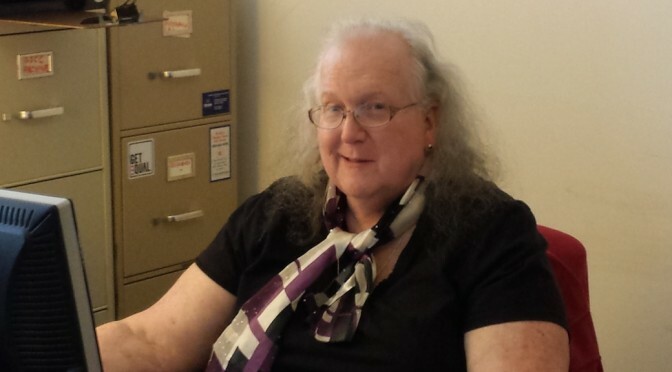 She generated the concepts that later became the Atlanta Transgender Center, has walked picket lines, done transgender education at all the local colleges, mentored many, co-chaired the Atlanta Transgender Day of Remembrance ceremony for 5 years, organized and been a panel member for community town halls, lobbied in Washington, and even testified under the Gold Dome. An active member of Ormewood Park Presbyterian Church for 17 years, Dana served four terms as an Elder on the Church Session. At he time the church closed due to aging out, she was serving as Chairperson of their Worship Committee, involved in every aspect of Sunday Worship Services. Her years of work in her churches have given her a wide base of knowledge, and many connections. Outside of work and church, Dana spent 40 years as a Civil Air Patrol volunteer, until forced to retire upon her transition. Holding many positions, her real loves are search and rescue, and communications. In her latter years with CAP, she enjoyed teaching both subjects, and enjoyed helping teenagers grow to become stronger, confident, responsible young adults. She held many positions of leadership and received many awards for her work, earning Masters (Highest) Ratings in Communications, Emergency Services, and Ground Team Leader (oldest active in the USA) and numerous Distinguished and Exceptional Service awards. She was a GA Wing (Statewide) Search Mission Coordinator, Alerting Officer, and Communications Officer; a Squadron Communications, Emergency Services, and Safety Officer, and assisted in starting a new squadron. She lost count of the number of her finds of missing aircraft and emergency transmitters. For the entire 40 years, she was certified and maintained ratings in, CPR, and first aid up to First Responder level. She also graduated from the US Coast Guard Inland SAR school, and the GEMA Rescue Technician course; was one of very few certified in GA CAP to work at the GEMA command center; helped establish and was one of about 20 in GA certified as an operator of the CAP airborne TV system, which she assisted in operating for area aerial surveillance & security during the entire 1996 Olympics (This type CAP aerial TV system was used to take the first aerial pictures of Ground Zero in NYC); and was a certified radiological monitor / instructor. Her CAP search work led to joining NASAR, earning a SAR Technician II rating, and certification as an instructor, team teaching many GA fire departments and DHR Rangers these skill sets. Dana is also an Amateur Radio Operator (OK, HAM radio) specializing in … no big surprise … emergency communications. She has been a NOAA storm spotter, and was reporting on the 1998 Tornado when it went through Dunwoody, Norcross, and Duluth, and then switched to Red Cross Disaster Relief for a week. She provided backup communications for Gwinnett County for Y2K, and numerous ice storms. As a certified Red Cross Disaster Assessment volunteer, she provided damage assessment, and emergency communications for all of the tornadoes in the metro area for many years. Dana has a son, a daughter, and 3 Grandchildren (to whom she is their Ya Ya).